Snakebusters reptile catchers and snake removals (24 hour), Melbourne and nearby areas only. Snakebusters reptile removals (24 hour), All parts of Australia (excluding Melbourne / see above). Melbourne's Snakes - the definitve paper. Terms and conditions of Snakebusters reptile removals. 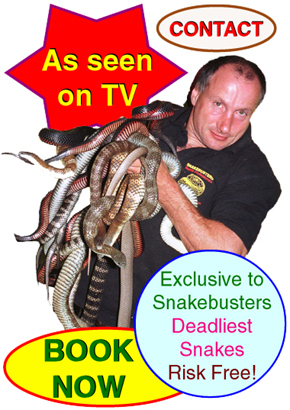 © 2009, Snakebusters, Snake Catchers, including as reptile catcher in Melbourne, Victoria for deadly snakes, Snakebusters, Melbourne, Victoria, Australia. All rights reserved. Licenced as Venomous snake catchers and other professional reptile catcher control in Melbourne, Victoria, Australia, Hands on Snake Catchers Melbourne, Snake Catchers Melbourne, Snake catcher Melbourne, reptile catchers and snake catchers.